Comerica Bank has been recognized as a certified silver-level Veteran-Friendly Employer (VFE) by the Michigan Veterans Affairs Agency. Almost 200 organizations across the state are certified VFE at the bronze-, silver- or gold-level. 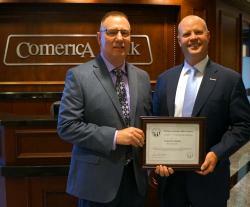 Comerica Bank is one of 19 organizations certified at the silver level. Comerica's policy for military leaves of absence and its practice of actively considering qualified veteran applicants enabled it to improve its certification to the silver level. Last year, VFEs hired more than 2,000 veterans. An estimated 14,500 have been hired since 2015. For more information about employment resources for employers and veterans, visit www.michiganveterans.com/categories/Employment.